The island of Patmos is one of those Greek gems that once visited, you will want to return to again and again. Here’s everything you need to know about Patmos, Greece. Greece has a lot of islands. 6000 at the last count, of which some 227 are inhabited. Of these, probably 10 such as Santorini and Crete are well known to people from outside of Greece. The rest are a bit of a mystery. They might be somewhere you go ‘Greek island hopping‘. They might be somewhere you go to get away from everything. My experience so far, has led me to believe that most of them deserve a higher profile than they currently have. The Greek island of Patmos is one of those. Actually, the Greek Island of Patmos is no stranger to tourism. It has been visited by Christian devotees for nearly two thousand years due to the Cave of the Apocalypse (more about that later). Today, most of those cave visitors turn up on cruise ships. They stay for just a few hours on the island, visiting the cave and other notable places of interest, before returning back to their ship the same day. There is much more to Patmos than the Cave of the Apocalypse. 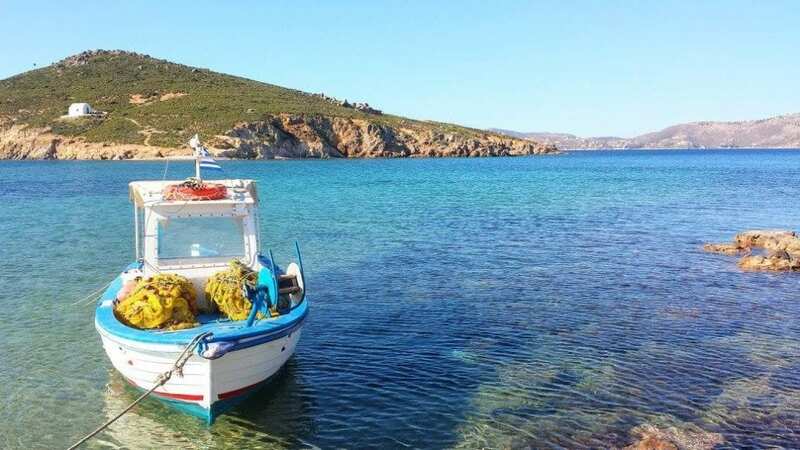 Patmos has all those great qualities you want from a Greek island – Superb beaches, clear blue seas, wonderful food, friendly people, and beautiful views everywhere you look. Patmos island you could plan to spend at least a week. Possibly two. Visitors to the Island of Patmos can be divided into two categories. The first, are the cruise ship visitors who I've already mentioned. The second, are holiday makers intending to stay for week or two week periods. I visited Patmos in June, before the tourist numbers had built up. There were few families on holiday, and most people seemed to be northern European couples in their 40s or older. Even on the popular beaches there were empty sunbeds when I visited. I bet that's a lot different in August! I asked around, and apparently it is different in the peak month of August. At this time, there is more of a younger Greek crowd who tend to be educated professionals in their 30s. The nightlife at this time of year was described to me as ‘more lively’. I somehow strongly doubt that it is Mykonos lively though. There are no huge nightclubs, and the religious influence on the island requires that loud music is not played after a certain hour. It might be busy in August yes, but party central? I think not. 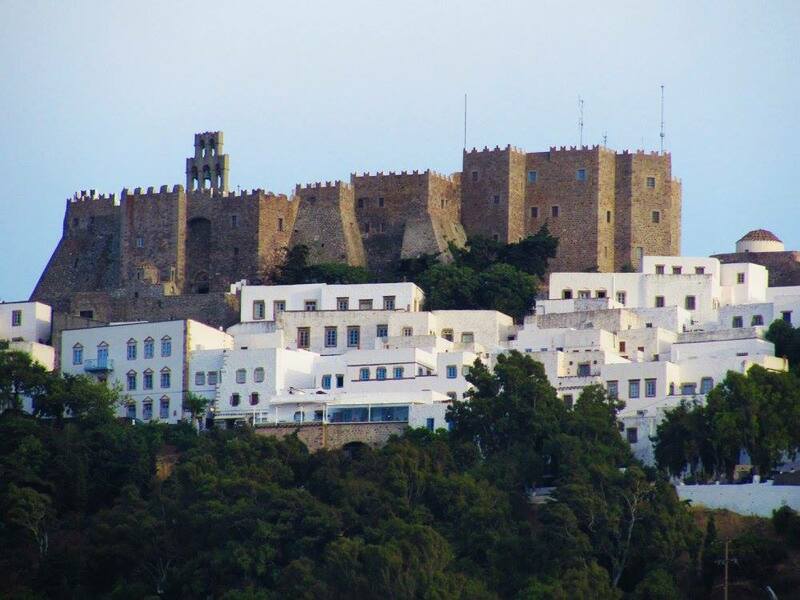 My opinion – The island of Patmos is most suited for professional couples who aren’t after a raging party atmosphere. It’s probably also a destination for people who have visited Greece a couple of times before, and want to try new islands. If you are someone who likes to appreciate their surroundings, enjoys good food, great views, and wants a relaxing holiday, this is the place for you. Where is the island of Patmos? Patmos is situated in the Aegean sea, and is one of the Dodecanese islands. 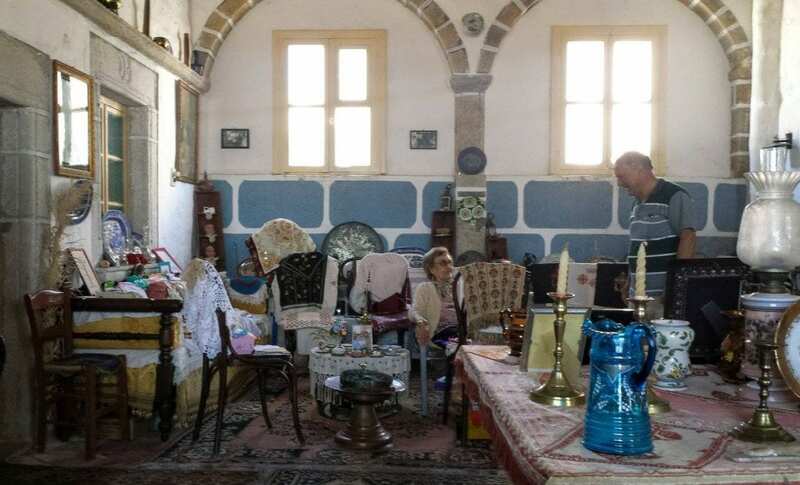 It's a small place with an area of just 34 square kilometres, and has two main settlements which are Skala and Chora. Unless you have access to a private helicopter (which some visitors to the island do! ), the only option is to use a ferry. The main crossing from mainland Greece is between Piraeus and Patmos. I used the Superfast Ferry Service which took around 7 hours each way. The use of a cabin, although slightly more expensive, is recommended particularly on the return journey. In fact, theoretically at least, you could visit Patmos on a long weekend from Athens. On the Friday evening, you board the ferry at 17.30 (ish), arriving at about 03.00 am. You then have all Saturday and Sunday there, and return on the Sunday ferry which leaves around midnight. You could then arrive back in Athens Monday morning and go straight to work! There are also other ferry crossings available, including the reasonably nearby island of Rhodes and Samos. The absolute fastest way to get to the island of Patmos, is to take a plane from Athens to Samos, and then take a short ferry journey. 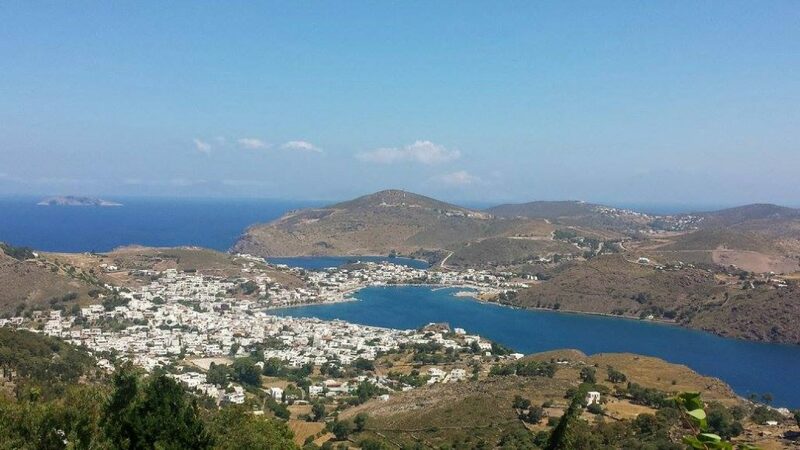 As with so many Greek destinations, my recommendation is to visit the island of Patmos during the off-peak months of June and September. At this time, you get all the benefits of the ‘good stuff’. These are namely warm waters to swim in, sun to tan in, and a choice of restaurants where you can easily get a table without the tourist crowds. What about Patmos in August? This is the month when prices rise, and tourist numbers are at the absolute peak. Book well ahead if visiting Patmos, Greece in August. In order to make the most of your time on Patmos, Greece, I would suggest hiring a car. Patmos Rent A Car have a good selection of vehicles to choose from. You don't need to hire it for the entire duration of your stay if you don't want. A 2 or 3 day car hire on Patmos should enable you to see all the main attractions, and especially get you to all those hidden beaches! There are only a couple of filling stations on the island though, so don't go driving off with the fuel light on – like I did! 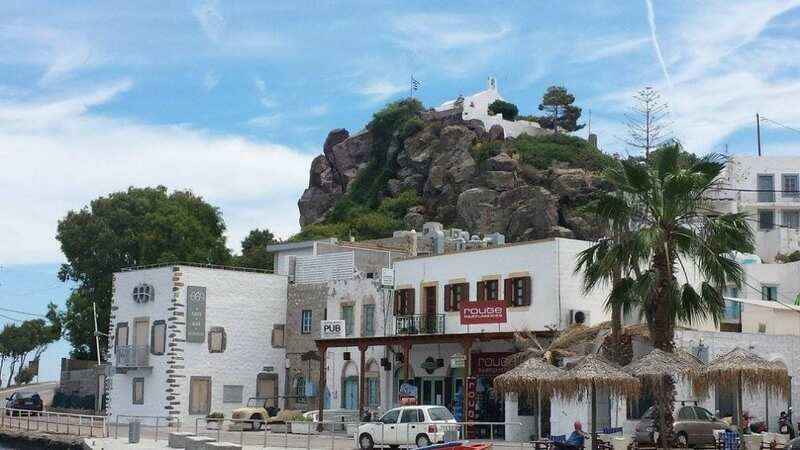 Here's a look at some of the things to do in Patmos. The ideas include what to see in Patmos, as well as some of the best beaches on the island. I don't want to use the term ‘tourist attraction' for the Cave of the Apocalypse on Patmos, but the queues and lines that appear when a cruise ship arrives on the island do lend it a somewhat conveyor belt feeling. My advice is to either visit early or late in the day, and at times when there isn't a cruise ship. 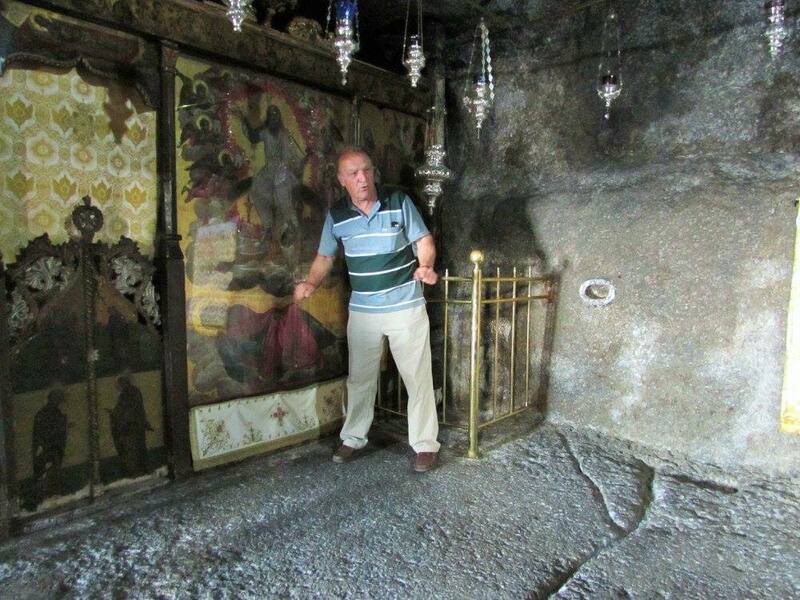 The Cave of the Apocalypse is where St. John is said to have lived. It is here that he had a ‘revelation', or received a message directly from God, which he then dictated to his disciple. This written work became known as the Book of the Apocalypse, or the Book of Revelation. If you are a Christian, the cave is likely to have more significance for you than it did for me. I found the general story interesting, but the cave itself rather disappointing. As I said, there is a lot more to the island of Patmos than the cave though! Sitting high on the hill of Chora, there looks to be a castle. It's actually a monastery, although it was used in the past as a last line of defence from pirates and other attackers for the inhabitants of the island. First established in 1088, it is dedicated to St. John, and is still the home of monks today. In a similar manner to the Meteora monasteries , this one is open to the public. It is an interesting place to spend some time walking around, and I was fortunate to be shown places not normally opened to the public. This included the magnificent library, which is a rich treasure trove of documents and books, some of which date back hundreds of years. The librarian at the monastery is currently in the process of digitising them so that they can be better preserved for future generations. Chora is the town built under and around the monastery. It's characterised by whitewashed houses, narrow winding alleyways, and some mansion residences. It's a lovely place to spend some time aimlessly wandering around, so make sure you take your camera! Some of the buildings can also be deceptively big inside. We dropped by an open house/unofficial museum where time seemed to have stood still. The property had been in the hands of the owner for many years, and had been passed down through at least 7 generations on the female side. Inside were a number of family heirlooms which had been accumulated over the years. Skala is the harbour town of the island of Patmos, and is the main point of arrival for most visitors. It is also the place where you can arrange tour booking, car hire and grocery shopping. Due to the limited road system on the island, you are bound to pass through here at least twice a day – possibly more! 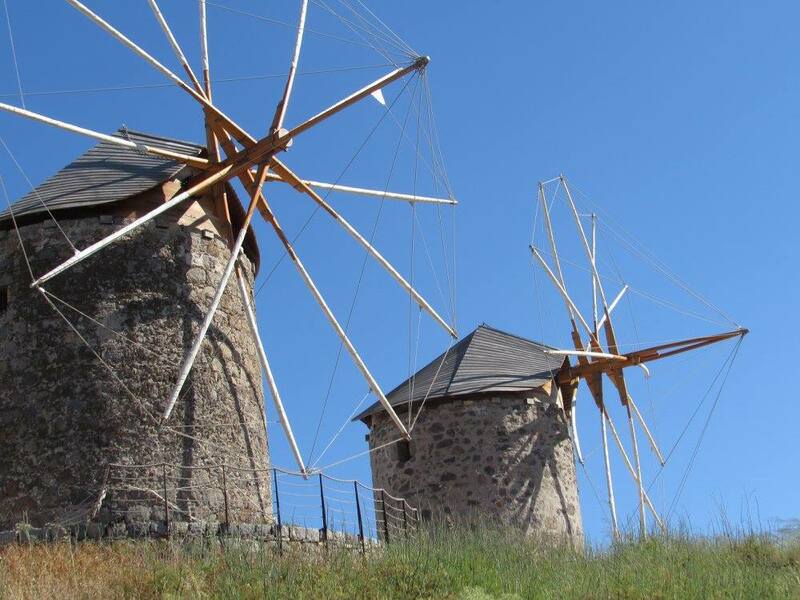 The recently restored Windmills of Patmos are certainly worth a stop as you drive around the island. Their restoration has been a source of pride to the people on the island. I talked briefly with one of the people responsible for making the project possible, and came away with the realisation that knowledge built up over hundreds of years can easily be lost within a generation. Many of the skills they used to restore the windmills had to be ‘rediscovered'. You might want to check out this video I found to find out more. 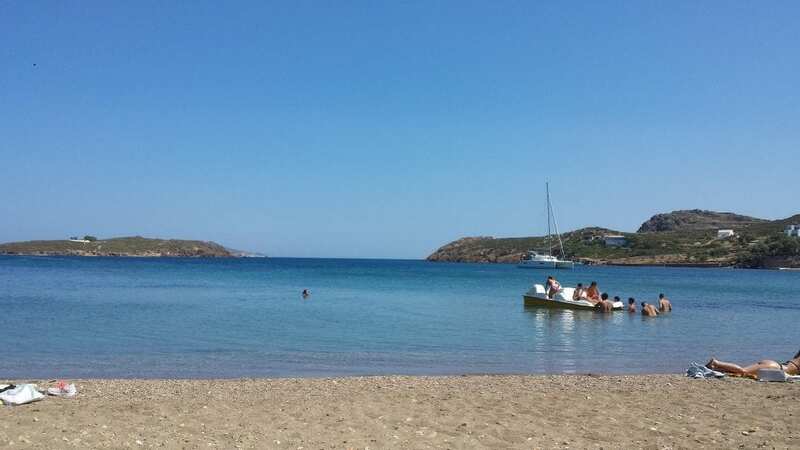 For such a small island, Patmos seems to have a lot of beaches. And they are all pretty good too! 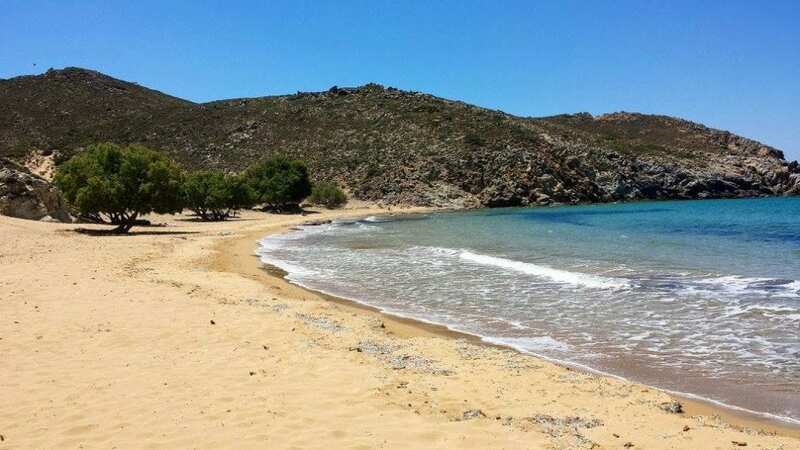 The most popular Patmos beaches are Lambi, Agriolivado, Skala beach, and Meloi. My absolute favourite though was Psili Ammos. It is a reasonably remote beach, which requires either a 20 minute hike to reach it from the nearest parking, or a 45 minute boat ride from Skala. It is certainly worth the effort though! Lovely sand, shade under the trees, and a family run taverna serving simple but tasty food. Note – When I visited in June, the beach was all but empty of people. In the peak season of August it can apparently be hard to find a spot to lay down! If you want to spend time there during August, I suggest leaving early in the morning to secure a good spot. 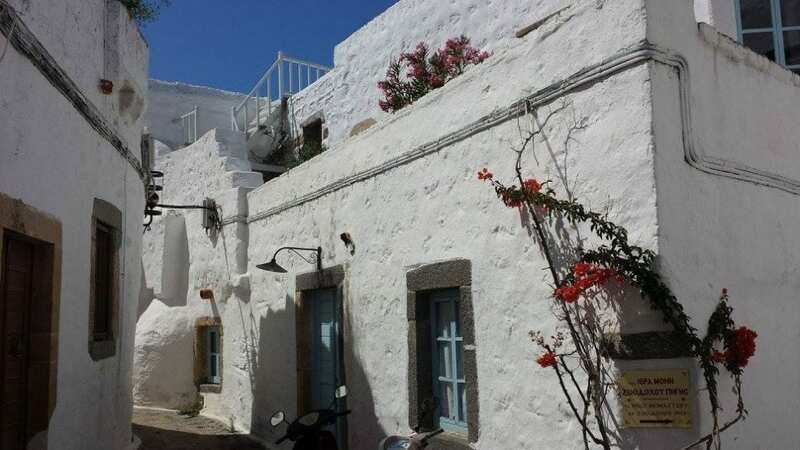 The island of Patmos has a wide selection of accommodation to suit every budget. When I visited, I stayed at Porto Scoutari Hotel, and to be honest, it's my number one and only recommendation! A lovely complex set in beautiful surroundings, friendly owner and staff, and incredibly relaxing rooms. 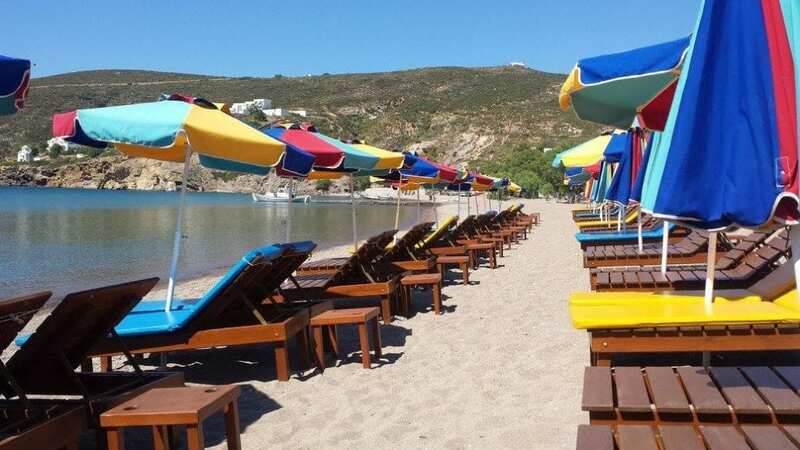 You can check out the Tripadvisor reviews here – Porto Scoutari in Patmos. I will have a few more articles about the island of Patmos going live over the next few weeks. If you are planning a trip there and have any questions, just get in touch. I would love to help! There's lots of great places to eat in Patmos. For a more detailed look, here's my travel guide to the best places to eat in Patmos.